All Posts Tagged With: "Oscars"
Los Angeles, CA – February 27th, 2011) – Actress Marisa Tomei rises to the occasion flawlessly in Lily et Cie 1950 Charles James Couture Gown on the red carpet at the 83rd Annual Academy Awards in Los Angeles. 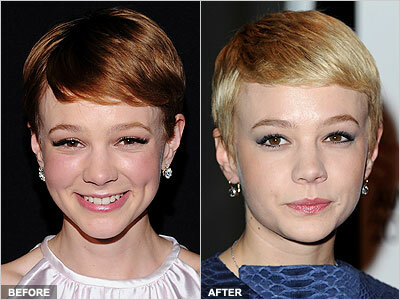 We picked some of our favorite hairstyles seen in the past and thanks to Photoshop placed them onto the heads of these following actresses that will be at the 2011 “Academy Awards.” So … what do you think? NARS Cosmetics will be lighting up the stage this weekend at the 83rd annual Academy Awards!NARS is collaborating with two celebrity makeup artists to create the looks for performers at the Oscars on Sunday: Mandy Moore and Florence Welch of Florence & The Machine. Celebrity makeup artist Kayleen McAdams is working with Mandy Moore who will be singing her song ‘I See The Light,’ from the film Tangled; and artist Tasha Brown is creating the look for Florence Welch, of Florence & The Machine, who will be performing the soundtrack from AR Rahman’s 127 Hours. (Florence is also a fan of the new Velvet Gloss Lip Pencils!). Jennifer Lopez aka JLO gets Talking Makeup’s Best Dressed award at Oscars 2010. Jennifer has many copy cats and we’re not naming any names, but no one does it better! JLO’s gown is by Armani Privé. Do you love? Celebrity Hairstyle: We all know what the Oscars are really about…beauty and style. Fekkai’s celebrity stylists will tend to the tresses of Hollywood’s most glamorous actresses on the red carpet this Sunday, March 7, 2010. Fekkai celebrity stylist, Adir Abergel, will create the award winning look for Best Actress Nominee Sandra Bullock. Renato Campora for Frederic Fekkai continues to wow the red carpet, styling presenter, Kate Winslet. Heidi Klum reveals how you can achieve her red carpet beauty secrets for under $50! Supermodel Heidi Klum and celebrity make-up artist Linda Hay, launched Victoria’s Secret Makeup Spring Look Kit and demonstrate how to get Heidi’s red carpet Oscar look for under $50. Additionally, for this year’s Oscars, Heidi is wearing a red dress by Roland Mouret for Diet Coke’s Heart Truth campaign and has also designed the Best Actress Nominees gift for Victoria’s Secret. The gift includes a Vintage Victoria lingerie set with a diamond and pearl pin.